Currently the layout is being rebuild in a new home. The trackplan below is old. The new home is only temporary. When we move into our permennant house then this trackplan or a refined version will be build. Here is the track plan of the Lone Wolf and Santa Fe Railroad. It is not drawn to scale. The original plan was drawn the old fashion way, on a drafting table, using ruler and compass. Because the blueprint was too large to scan I redrew it here using Microsoft Paint. The layout fills a two car garage. It is built against two walls with the other wall open which has a doorway into the house. The garage door is the fourth wall. Don't tell the building inspector but the garage door has been secured in place and can not opened without a lot of work. There is regular door built into the garage door for easy access to the driveway. The design is an over under figure 8 with the crossing near the summit of the pass and the tunnel. This figure 8 allows for a longer mainline length without having to use a duck under. Yes the track does go through the same area twice but at different elevations. This is ok because the train could not go straight up over the hill, so just like the prototype it has to work it's way up. The gray area is open aisles. Every time a train goes through the Twilight Zone Tunnel it changes into another train going the same direction. East bound trains that originate in S.B. go one lap and become a new east bound train. The card cars are changed and the train takes one more lap. This time it will arrive in S.B. as incoming freight from the west. This method allows for continuous self staging of trains. The layout is currently going through a major remodeling to build the trackplan above. Changes include widening the minimum radius on several curves, lengthening passing sidings, and adding more control blocks. To make room for the new auto distribution center, Pipe Co has been moved to the foothill area and has been renamed Foothill Steel Distributors. Cargill Flour Mill is being built in an undeveloped area. The High Desert has expanded into an area which was formerly the pantry which was built into a corner of the room. This left room for several new warehouse distruibution centers, a scrap recycler and another mine. On the western end, the main line has been continued down to Orange County so Metrolink can run their infamous Beach Train. Along the way it passes through Riverside County where a brach serves the agriculterly rich, Moreno and Hemet Valleys. The whole beach and Riverside County section started out as another attempt to build a staging area which failed. It was more fun to scenic it and create a few more industries to switch. Both the Hemet Valley line and the Beach line dead end but each have a siding for the locomotives to run around the train and get to the other end of it to pull it back to Berdoo. Of course Metrolink doesn't run the locomotive around the train. The engineer just walks to the other end of the train and drives it from the control cab located in the last coach. Evolution of a track plan. Photo of original layout from the late 1970s. 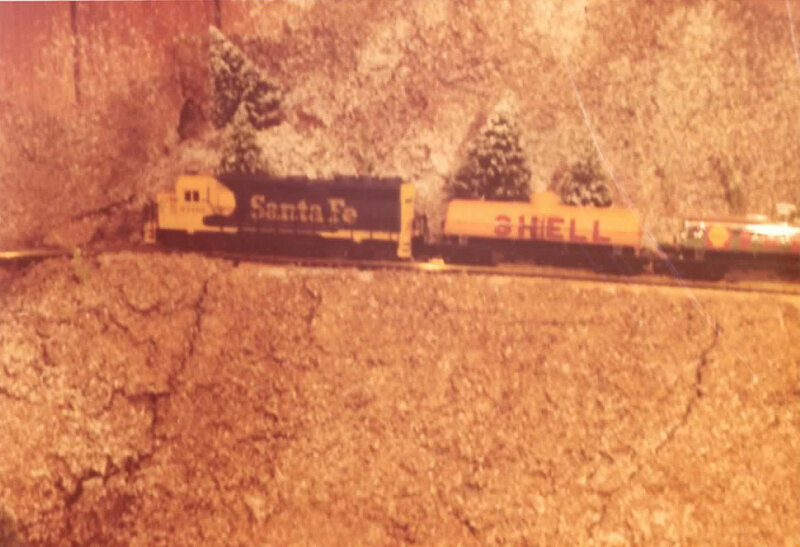 The track plan of the Lone Wolf and Santa Fe Railroad has changed over the years. In the very beginning it started out as a Tyco train set with an oval with a spur which was on top of a 4x8 sheet of plywood. Next I added the track from another Tyco train set and a couple more switches to make a siding. This was a good start but I wanted more action so I needed to expand and began building what I consider to be my first model railroad layout. I was about 13 years old when I started it. I still had a lot to learn. Back in the day, point to point design with hidden staging was supposed to be the way to go. I designed my layout to include both. I ended up being very disappointed with both ideas. With hidden staging, trains had to be backed into the staging which always was a hassle. I had a tiny little aisle to access the staging tracks but it seemed like I spent all of my time there. In future remodels this aisle would be wider. Point to point operation had big problems too. Trains leaving the staging tracks would eventually end up on the other end of the line with no where to go and no easy way to turn them. There was a turn table to turn the engines but the overall level of enjoyment of just running trains seemed to be missing because of the short run length and the hassle of re-staging. Some people complain that running trains around in circles is boring and unrealistic. I missed the train chasing it's tail around in a circle. Soon I blasted a tunnel through a mountain and connected the yard with a cattle ranch spur so I could run trains continuously. The staging problem would not be solved until the next major remodeling of the layout. In the early 1990s I began to rebuild the layout to improve operation. The first thing I did was to widen the aisle behind the staging tracks, scenic the area and plan to connect the closed end to the main which will now feed it. This made the staging yard self staging and also increased the mainline length because it is now a functioning area of operation. Another major improvement was lengthening the yard and adding an intermodal area. A new peninsula was added and became the focal point of local switching activity because of the many business located on it which relocated there. Wolf mountain has stayed in the same place. The main line has been rerouted to make the plan more walk around but there were still flaws which were eventually solved on the current version of the layout. If you closely compare the three layout plans you can see how things changed as I learned from my mistakes. I thought about starting all over from scratch but instead of fixing my shortcomings I would probably just create a bunch of new ones so I just keep on refining what I have. Even now I still am remodeling to make some curves wider and some sidings longer. In the newest remodel the old High Desert peninsula was rotated 90 degrees and moved to the right side of the room and lengthened. The North End peninsula was rotated 180 degrees. The area that originally was the West Side is now the High Desert Staging Yard, and the old staging yard is now the main yard in Berdoo. I made this change so that most of the time going to the right means heading east, and going left means heading west. The exception is only in the most eastern part of the High Desert. Here is a new section being built on a shelf. This is just one section. There is a lot more to it but this is the only image I have of it. This section has Highland on the left and Redlands is on the right. Highland features orange groves in the foothills, a victorian farm house and Sunkist Packing House. Redlands features a church, a night club, and two orange packing houses. Take the virtual tour of the layout.